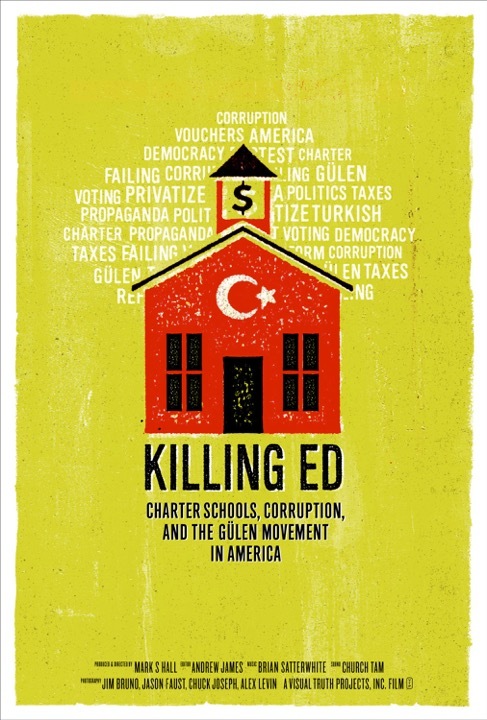 Visual Truth Projects’ Documentary KILLING ED Trailer Released, Premiere Set Exposé Uncovers Gülen Charter Schools’ Abuses of Immigration, Teachers, Students, Labor Laws, et al. Today America gets its first lesson in the Gülen charter schools scandal with the first trailer, website, and theatrical NYC premiere announced for KILLING ED—a new documentary film from Visual Truth Projects and award-winning director Mark S. Hall that uncovers a shocking fact: that over 150 publicly funded, privately owned charter schools in America are in fact a “Trojan horse” introducing a variety of abuses. Hall, who previously directed SUSHI: THE GLOBAL CATCH (2012), uses KILLING ED to expose the largest charter school network in the country—the Gülen Movement—which receives over $500,000,000 a year directly from American taxpayers. What started as due diligence for a non-profit ended up being a five-year trek to uncover the “worst case scenario” of the privatization of education, which has emerged as a result of the often misunderstood charter school model. Director/Producer Mark S. Hall visited 24 charter schools around the US (19 of which were Gülen-affiliated). He conducted 44 interviews with politicians, experts, parents, teachers, charter advocates, Turkish-Americans and Turkish journalists. Ultimately, he interviewed former followers of Gülen to discover the origin of the “Gülen Movement” and discovering, shockingly, the apparent destination of many millions of American tax dollars annually. Originally, charter schools were intended to educate students who were having difficulty learning and had dropped out of traditional public schools. Freedom from many of the regulations required for public schools was given to those who wanted to develop new ways of teaching within the public education system. However, a lack of oversight and regulation, generally, has led to the “worst case scenario” of a little-known but rapidly growing Islamic movement using public funds for anti-democratic activities such as purchasing influence, oppression of female teachers, as well as gender pay and religious discrimination and - as the film outlines - the apparent funneling of these public school dollars for its startling political objectives in the nation of Turkey. KILLING ED will have its premiere in New York City at the Cinema Village (Cinema Village, 22 East 12th Street, New York, NY 10003) March 25 – 31, 2016. Other screenings are in the works across the country and individuals and groups can book a screening for their community or organization via the Tugg.com platform. Digital/DVD/BluRay release dates will be announced in March. Mark S Hall is a risk-taking documentary filmmaker and lawyer based in Austin, Texas —whose curiosity and unusual set of skills drive him to tell complex stories for the public good. The award-winning producer and director of SUSHI: THE GLOBAL CATCH (2012), Hall is now taking on a much bigger fish: the growing Islamic movement of imam Fethullah Gülen. It was as an impartial citizen that he stumbled upon a troubling story while volunteering at a nonprofit—due diligence led him to his next big catch. His new feature-length documentary film KILLING ED discusses the corruption and corrosive influence of a little-known, global Islamic group based in Pennsylvania known as the Gülen Movement that operates one of the largest network of taxpayer-funded charter schools in the U.S. that are the worst-case-scenario—schools with questionable academic, labor, and H1-B visa standards. Hall’s previous documentary feature, SUSHI: THE GLOBAL CATCH, premiered in June 2011 at the Seattle International Film Festival where it won a Special Jury Prize. SUSHI examines the traditions, global growth and potential consequences of what a cuisine in a rapidly globalizing world. The film has screened in theaters, television and at prominent festivals in over 40 countries worldwide. It received a major market theatrical release in August, 2012 through the New York distributor, Kino Lorber, Inc. Hall’s television-focused work includes MISSION ON SEVEN (2010), a half-hour documentary exploring the film archive at the Harry Ransom Center, which won a Platinum Award at the Houston Worldfest Film Festival in 2010. He lives in Austin, Texas.